These patch cords fit in the tightest spaces,where regular Cat6 patch cord is too bulky. 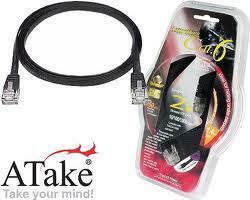 Flat, fully molded cord gives a neat appearnace to desktops & wall outlets. Used to connect your network card to a 10/100/1000 Base-T hub or switch. Patch cables have stranded copper conductors for flexibility-great for frequent changes that occur at the wall outlet or patch panel.